The name Lamington is so famous and nearly everyone has tasted and quite probably also made them. The Australians have really scored full marks by producing such excellent scrumptious treat! I surfed around in the net and saw like over 1 million recipes of it lol.. The main version was with the cocoa filling, some had custard and some had jam into jelly form , so I liked the jelly variation and got all set to make it. Mostly all had the choco sauce with little milk in it, so I used both, choco milk and grated some fine milk chocolate bar to make it yummier. I cannot mention that this recipe is from A B or C because I had a look at many and then did what I felt will go good, the sponge cake is a normal soft one with the basic ingredients. 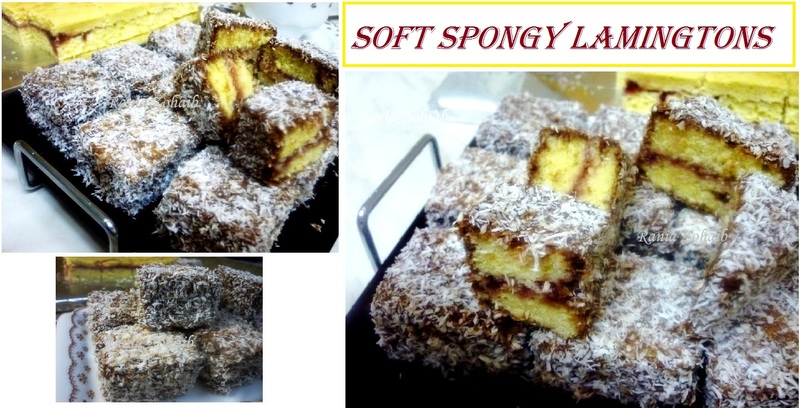 2*Many use a special Lamington form for it, I don’t think it is necessary as you can make it in any square form and cut nice cubes out of it. 4* Whenever you have to do any filling in any cake which you need to cut in halves always let it cool down complete and if you have less time then simply place it in the freezer. *when all has been mixed well, just beat the batter once or twice with the mixer and then stop! *now heat a small saucepan and put the raspberry jam in it and mix it very slowly, it will change into jelly, keep mixing so it does not burn or get thick. Usually we toss in fresh grated coconut but I din’t have any and if then who would open it : ) So I used the dry one, which tastes equally super! There you have your ultra yummy Lamingtons ready!!! I wanted to ask two things,how long canu keep them refrigerated and are they served cold or a little warmed up? I just made these,they ultimately turned out to b fine,not very soft as i overbeat the batter after adding flour,my question is after adding flour the batter became too thick,,,i had to add some milk to make it.plz help me out what went wrong or did its supposed to be thick. Dear Beenish did you use a measuring Cup for it? because if the flour is even a bit more in quantity the batter will be thicker, but dear you did absolutely right by adding some milk in it, as I do the same if I feel it is thick. I hope you liked them :)Thank you for giving them a try!